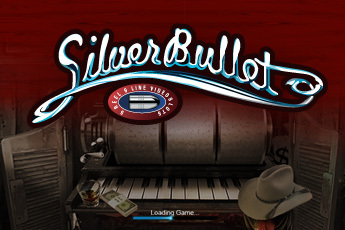 Silver Bullet Slots is an amazing slots game from the creators of the best slots games on the internet – PlayTech. It was released in late October of 2006, but don’t let the age of the game put you off, as you are going to have an absolute blast playing it. The game has five reels and nine paylines, which, in conjunction with the 39 winning combinations, gives you a heck of a chance of winning. Moreover the winnings are very generous, as the jackpots show. The big jackpot is of 10 000 coins and the second one is of 1000 coins. The coin sizes vary from $0.01 to $5.00, which is a good variation frequently found in the slots games from PlayTech. Moreover the max coin amount you can bet is of 9 coins. The theme of the game is Western and there is a wide array of symbols, from a barrel, a bomb and a sheriff badge to a seven, a horseshoe and a whisky. The wild symbol in the game is a star and the scatter symbol is a Colt revolver. Also good additions to the game are the autoplay mode, and the bonus game on the second screen – dollar ball. I would definitely recommend this game to everyone.